There is a refrain repeated over and over again in the first chapter of Genesis: “And God said, let there be. . .” I don’t think the author was just repeating this for merely stylistic reasons. The authors wanted to emphasize the fact that this physical world was brought into existence via the power of God’s spoken word! The Bible says: “Long ago, at many times and in many ways, God spoke to our fathers by the prophets, but in these last days he has spoken to us by his Son, whom he appointed the heir of all things, through whom also he created the world. He is the radiance of the glory of God and the exact imprint of his nature, and he upholds the universe by the word of his power. (Hebrews 1:1-3 ESV) Even now, the world as we know it is sustained by the power of God’s word! But the purpose of this post is not so much to talk about the power of God’s word, but rather the power of our word! Let me show you what I’m talking about. The same record that tells us that this world was created by the spoken word of God, also tells us that we (mankind) were created in the image and likeness of God and given dominion over the earth. Now anything that is created in the image and likeness of something or someone, also shares the characteristics and traits of the someone or something that created it! Hence, just as God has creative power in his word, we also have limited creative (or re-creative) power in our word! Therefore just as God honors and respects his word we should honor and respect of our word! Jesus said: “Every idle word that men shall speak, they shall give account thereof in the day of judgment. (Mat 12:36 KJV) In that text, the Greek word that is translated as “idle” has the connotation of “non-working, empty or vain.” The point is that we should make every word we speak work for us and not against us! We should not talk just to hear ourselves talking, but rather we should be thoughtful and intentional with the words we speak. We should honor and respect our word in the same manner that God honors and respects his word. Say what you mean and mean what you say! Don’t use your word to deliberately mislead; be intentional in using your word to convey your will and intention because that’s how God employs his word! Speak intentionally and deliberately: Don’t just talk to hear yourself talking or just to be saying something! Use your word to build up; not to tear down! The ole nursery rhyme that said: “Sticks and stones may break my bones, but words can never hurt me,” was not accurate! 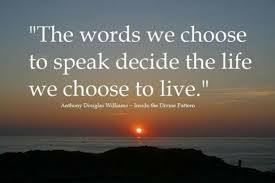 Words can wound the spirit and break the will! Words can inspire, they can also discourage! Words can build up and they can also tear down! Speak what you want; don’t speak what you don’t want! Jesus said in Mark 11:23: “For verily I say unto you, That whosoever shall say unto this mountain, Be thou removed, and be thou cast into the sea; and shall not doubt in his heart, but shall believe that those things which he saith shall come to pass; he shall have whatsoever he saith. (Mar 11:23 KJV). It’s interesting to note that Jesus didn’t instruct his disciples to speak to God about the mountain; he told his disciples to talk to the mountain (about God?). It could very well be the reason many times our situations don’t get any better is because we keep talking to God about the problem, rather than speaking to the problem. Your word is too important and powerful for jesting and foolish talking! Keep joking to a minimum! Honor the intentional power of your word! Don Miguel Ruiz writes, in his work: “The Four Agreements,” “The first agreement is to be impeccable with your word . . . Why your word? Your word is the power you have to create. Your word is the gift that comes directly from God….Through the word you express your creative power. It is through the word that you manifest everything.” The Bible says: “In the beginning was the word. . .” Of course the scripture reference is the Word Incarnate: Jesus of Nazareth. But it also expresses a principle of life: Everything in our lives begins with a word, therefore, we should not only honor the word of God, but we should also honor the word of the creatures made in the image and likeness of God! We should honor our word!